Eleganzia IRM Mobilhome 32m² two bedrooms, designed for 6 people with its sofa bed. You will find a bedroom with a double bed, a shower room, a bedroom with two single beds, a main room with sofa and coffee table, TV, dining area, kitchen area with oven, 1 micro -onde, coffee maker, kettle, toaster, crockery for 6 persons ...., separate toilet, semi covered terrace with garden furniture. The little extra, washing machine in the mobile home. Our friends the animals are accepted in this mobile home under conditions of being up to date with their vaccines, to be kept on a leash in the campsite and that their excrements are collected. No supplement but a deposit of 200 € is required. 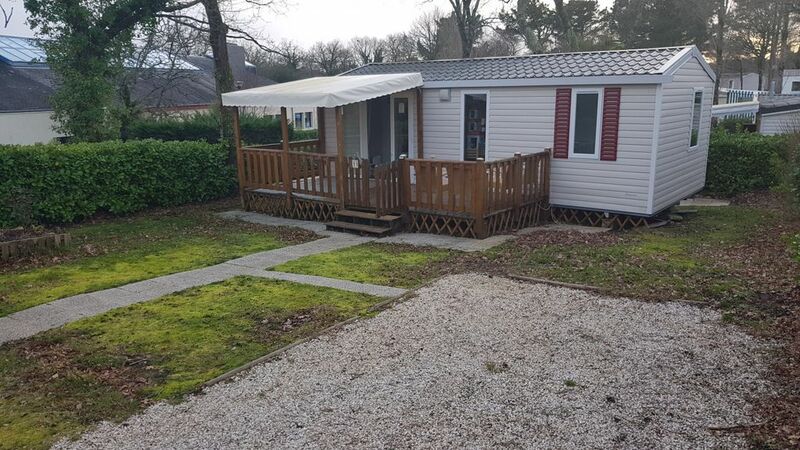 The mobile home is located on a beautiful 4 * campsite in southern Finistère, where you can relax by its swimming pools (indoor or outdoor), down the water slides (swimming pool open from the Easter holidays and until the end of All Saints holidays), enjoy the various activities offered throughout the year, children's clubs are open during all school holidays. Beautiful beaches are located near the campsite, the closest is 6 km and is called the beach of Tahiti!